Hello hello! Merry Christmas! hope you're all having a lovely day and eating lots of delicious food! 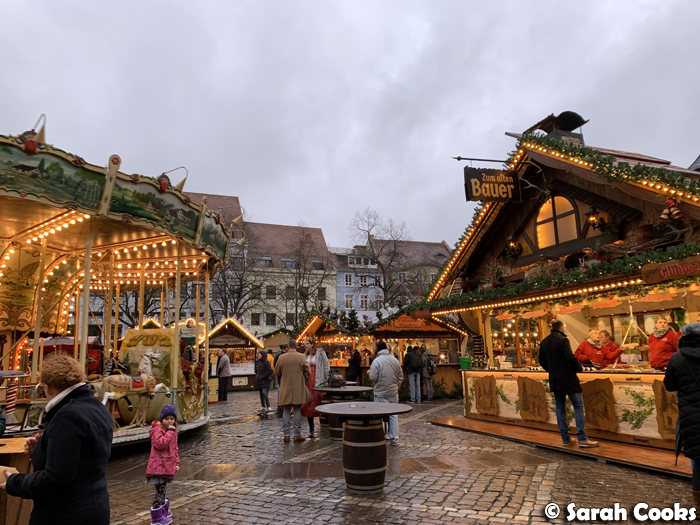 We're actually in Germany for Christmas this year, spending time with Sandra's family and enjoying Germany's wonderful Christmas markets. Woohoo! 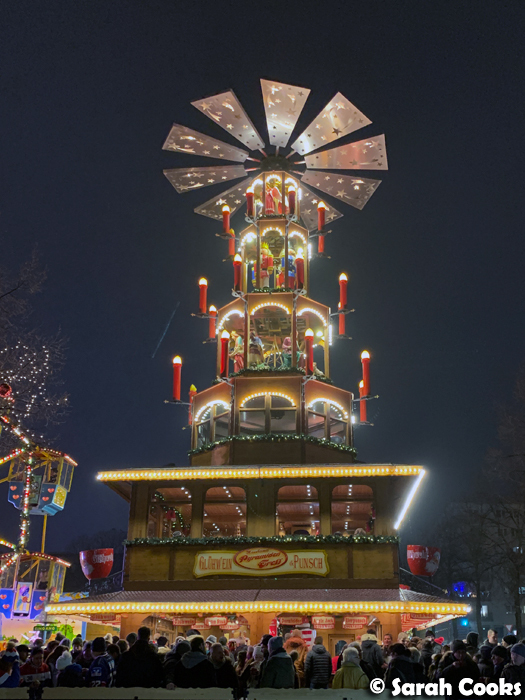 I love German Christmas markets, and I think they're essential part of the German Christmas experience. 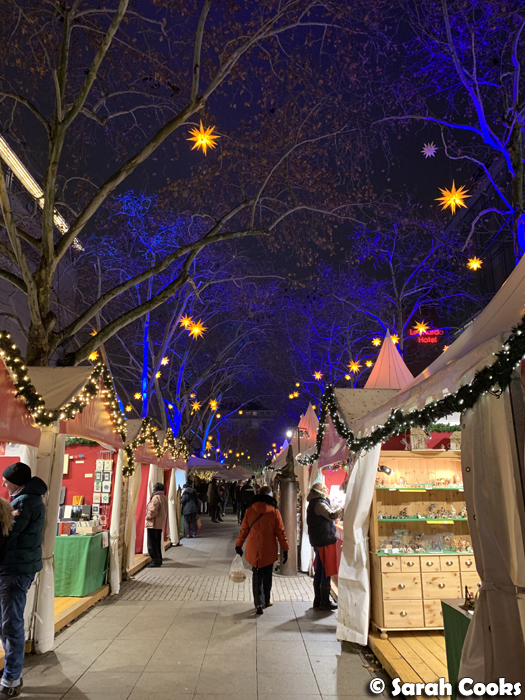 It's so lovely walking around the stalls with the lights and the people, and of course a mug (or two) of Glühwein. (Here's my recipe for Glühwein for those of you on the other side of the world). 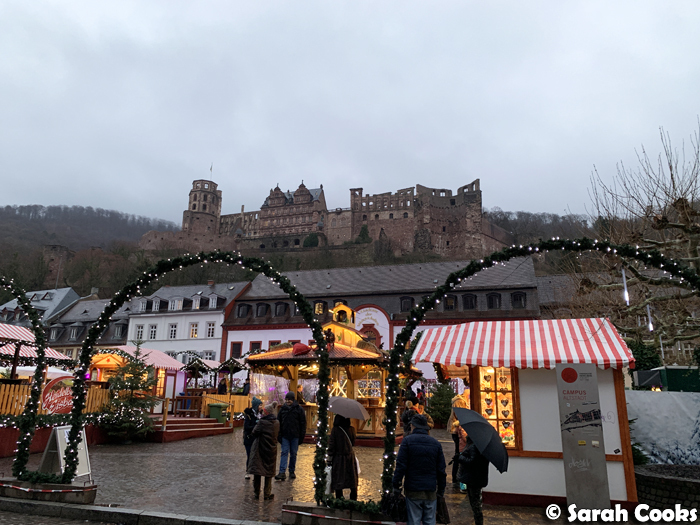 We've visited three Christmas Markets whilst we've been here, and I want to tell you all about them! 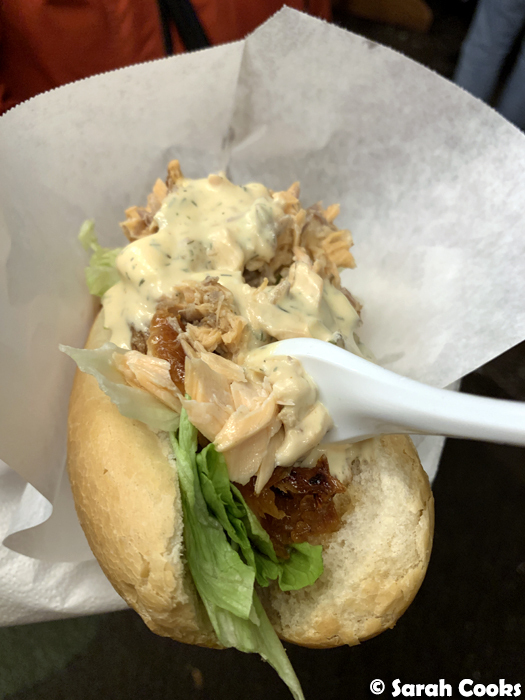 The three markets we visited (Mannheim, Bensheim, Heidelberg) were all different in terms of atmosphere, but the actual stalls were all quite similar, so I thought I'd show you a couple of photos of each market, and then get into the food and drinks we enjoyed. 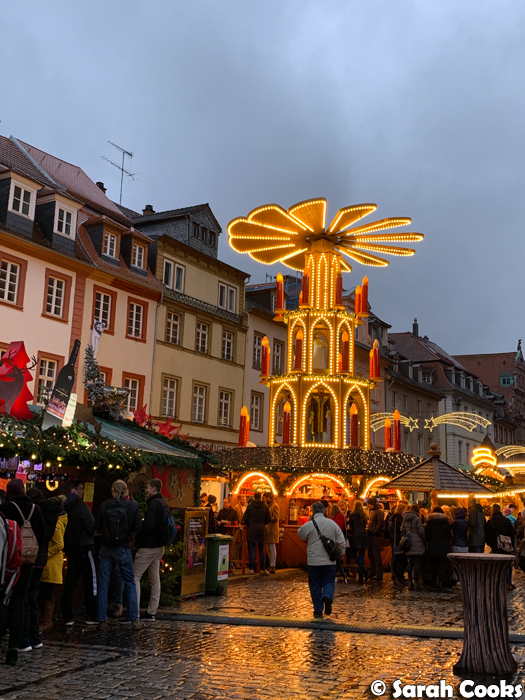 Bensheim has a smaller Christmas market, with the stalls dotted in and around the old city. The atmosphere is super gemütlich! 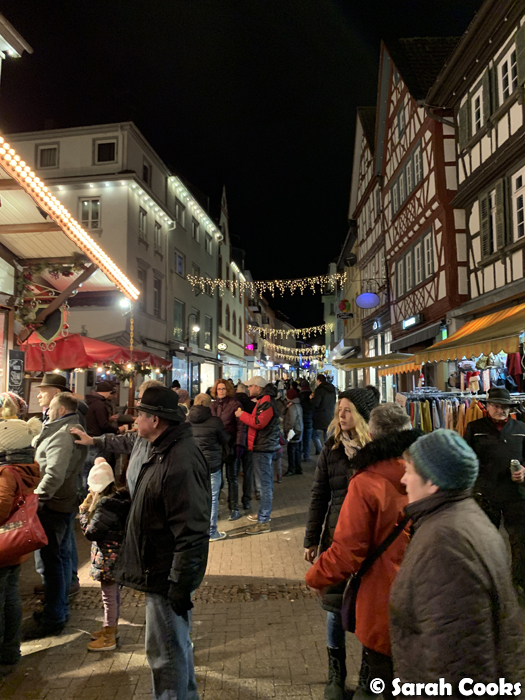 The Heidelberg Christmas Market was more spread out than the other two, with groups of stalls being set up in courtyards off the Hauptstrasse (main street) in the Aldstadt (old city). It wasn't quite as atmospheric as the other two, but it was still enjoyable, and I loved seeing the old castle from the market. Ok, let's look at the food and drink! 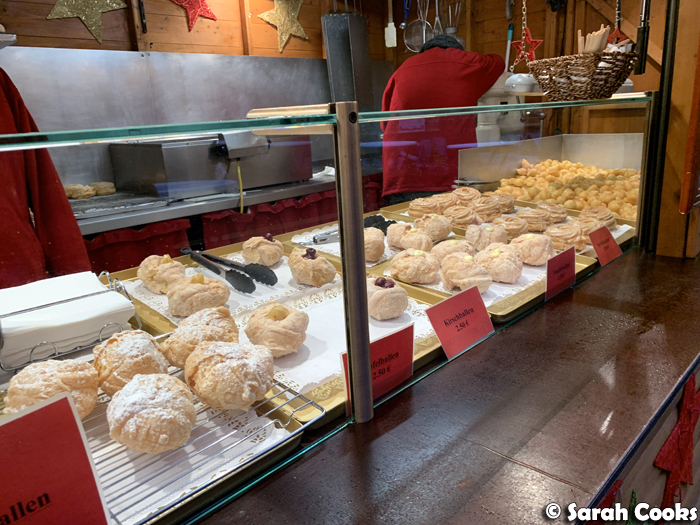 The following pictures are a mix from all three Christmas Markets that we visited. 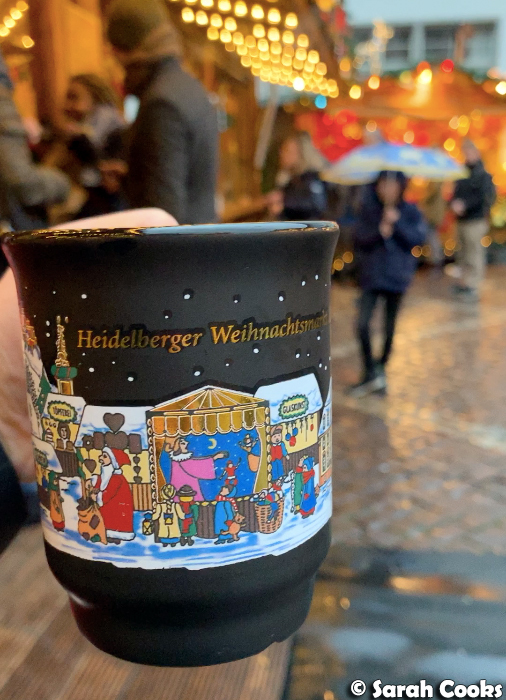 For me, it is essential to have a mug of Glühwein (mulled wine). 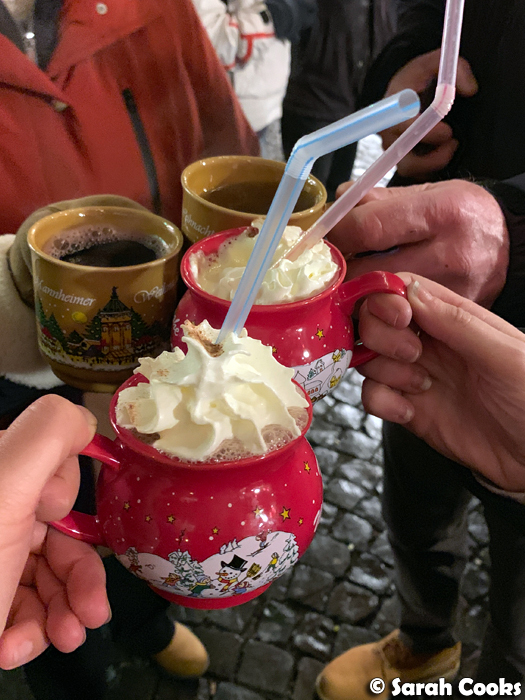 Traditionally it's made with red wine, citrus fruit and spices, but you can also get different kinds, like white Glühwein, Kinderpunsch (non-alcoholic), or Glühwein with a shot of schnapps added. 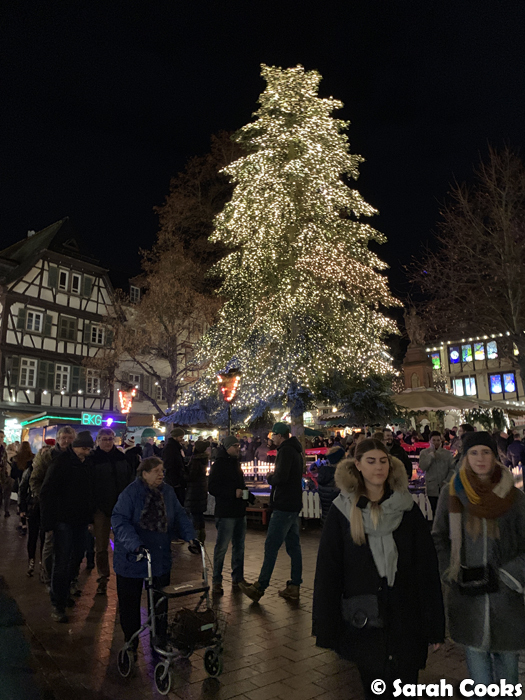 My friend Clarice came to visit from Paris for a night, and we took her to the Mannheim Christmas Market while she was here. 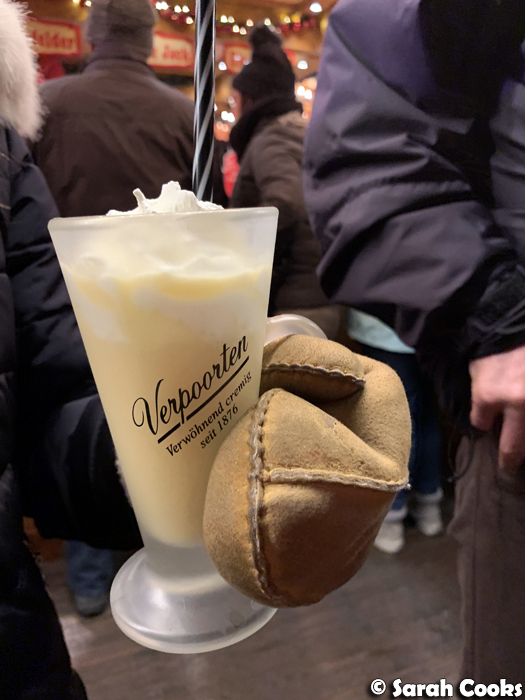 She's a bit of a Christmas Market-enthusiast, and was keen to have some Eierpunsch, a warm punch that's based on Advocaat, and is similar to eggnog. In the below picture we've got normal Glühwein, white Glühwein, a hot chocolate and another Eierpunsch! 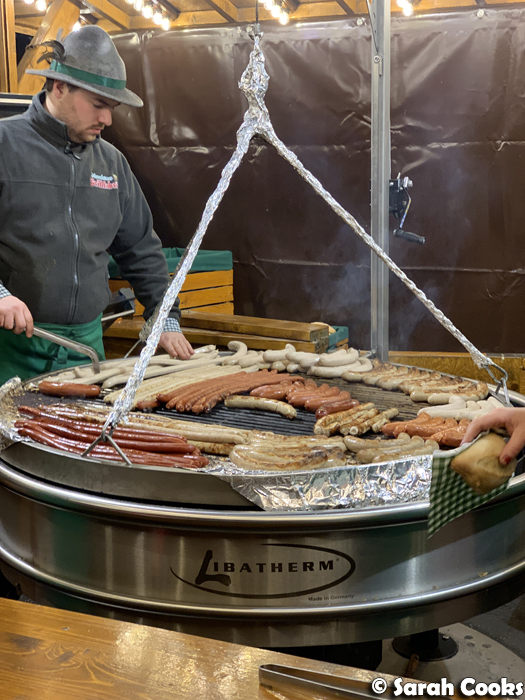 It's not really a German celebration without sausages. Yummmmm! 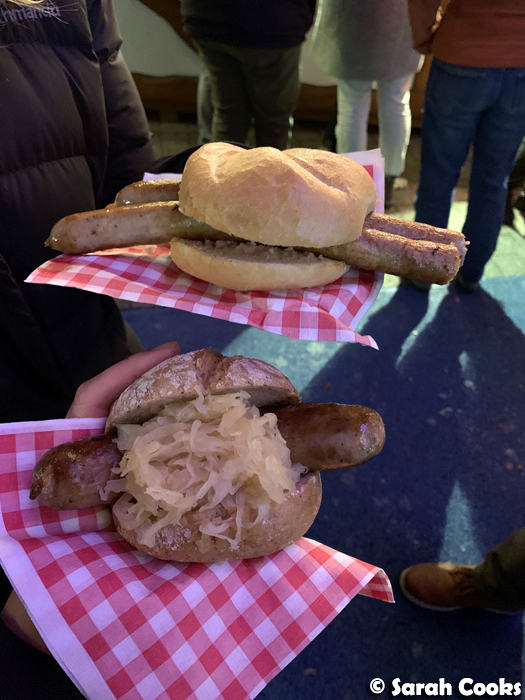 Sandra was keen to have a Thüringer (as you can't get them back in Australia), and I tried a wild boar Bratwurst with sauerkraut. Both were great! 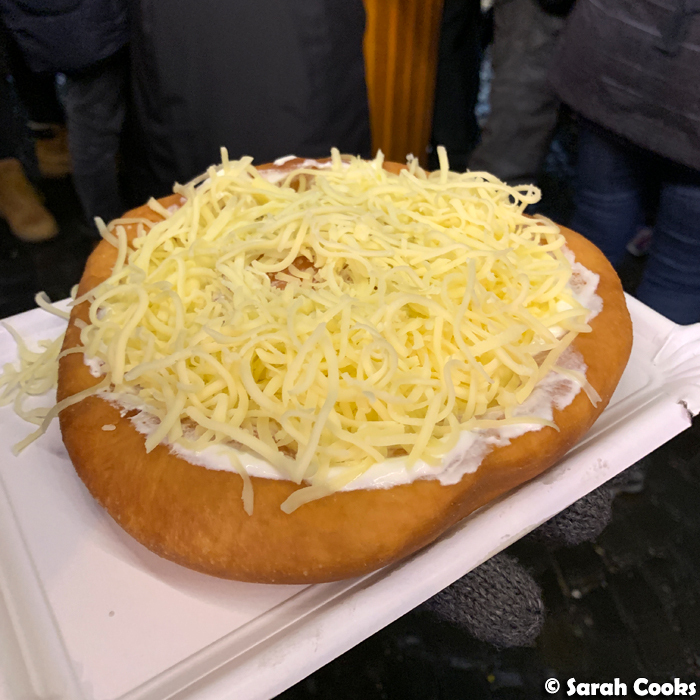 You may remember last time I came to Germany for Christmas, I was too full to try a Lángos. No such mistake this time! 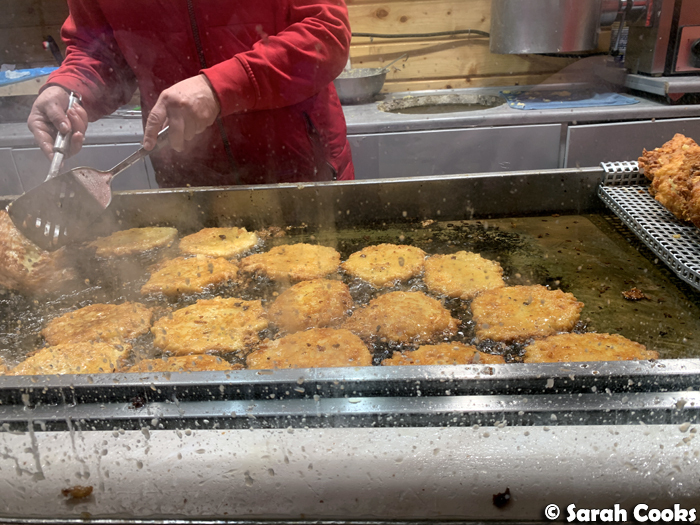 Lángos is a Hungarian delicacy of deep-fried yeasted dough, topped with whatever takes your fancy. I tried sour cream and grated cheese and it was glorious. 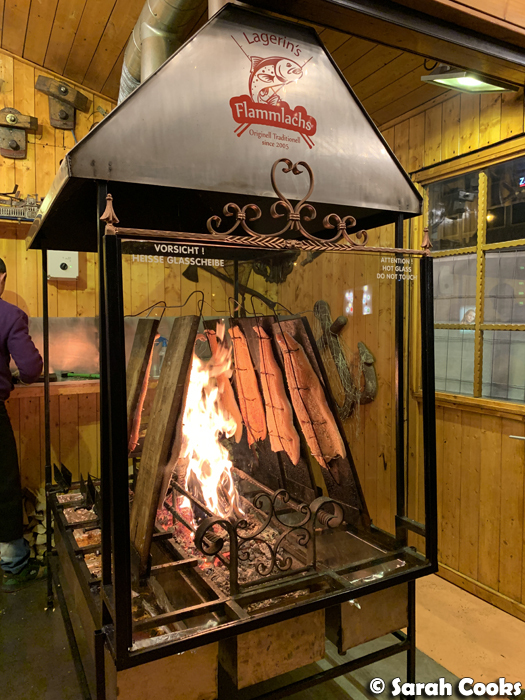 We saw this impressive hot-smoked salmon stall at the Mannheim Christmas Market. Clarice got a roll and said it was great! 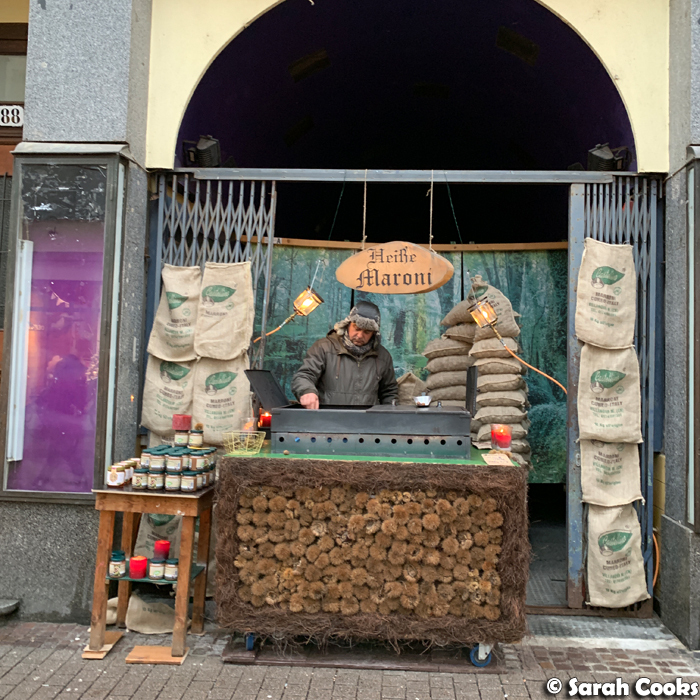 Hot roasted chestnuts are very popular, and I particularly liked this guy's stand at the Heidelberg market, all covered in hairy chestnuts. 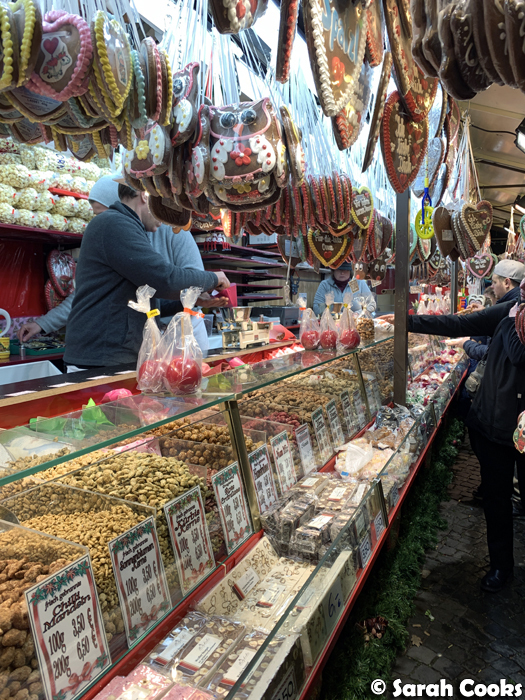 These sweet stalls are super inviting - full of different types of Lebkuchen (gingerbread), sugared nuts, marzipan and other sweet treats. 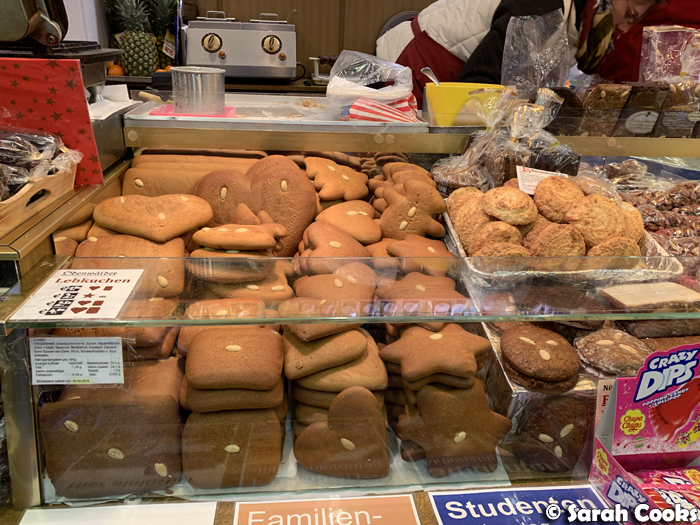 Plain Lebkuchen is very nice, but real Genießers go for the Elisen Lebkuchen. (They're the round ones in the bottom right of the below photo, each with three almonds on the top). The plain ones are made with white flour and are like a spiced soft cookie that can sometimes be a little dry, but the Elisen Lebkuchen are made with generous amounts of ground almonds and hazelnuts, and are super moist and fragrant. 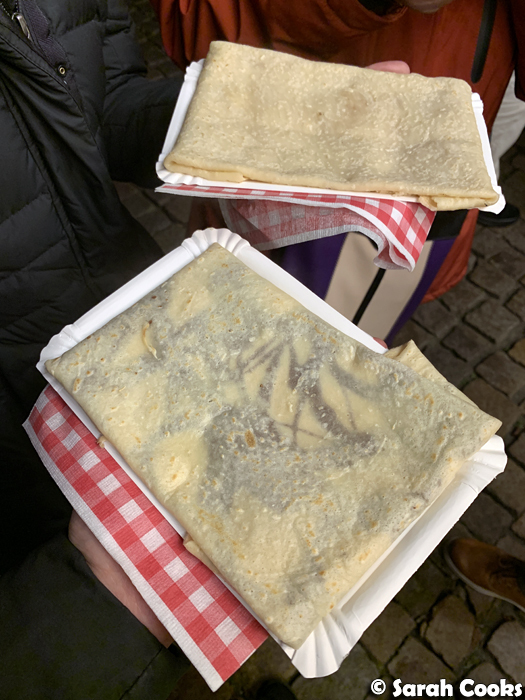 I bought a few types of Lebkuchen to take home, but for eating at the market, you can't beat a crepe or waffle - it's so nice wolfing into a hot one on a cold night! 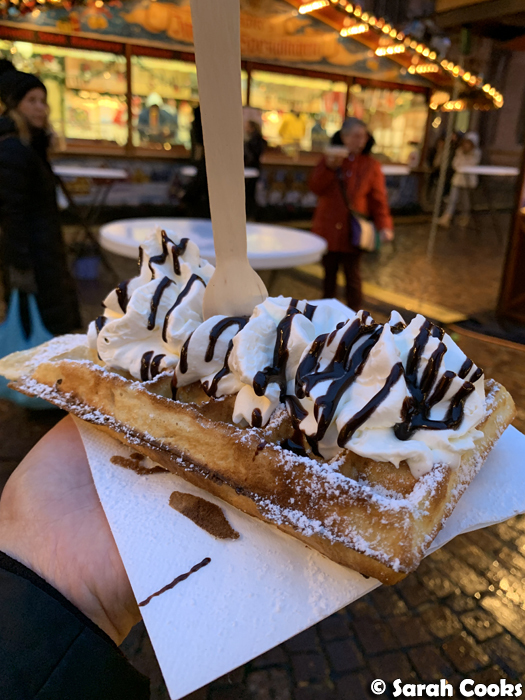 The waffles in Germany are super light and fluffy and crisp. Those are also German amounts of whipped cream. Ahem. Waffles are my favourite, but crepes are good too! (I actually only ordered this crepe below because the stall had run out of waffle batter, but I still enjoyed it). My family likes crepes with apple sauce; I prefer nutella. Sandra walked past and went "ooh, Spritzgebäck!" and immediately bought one. 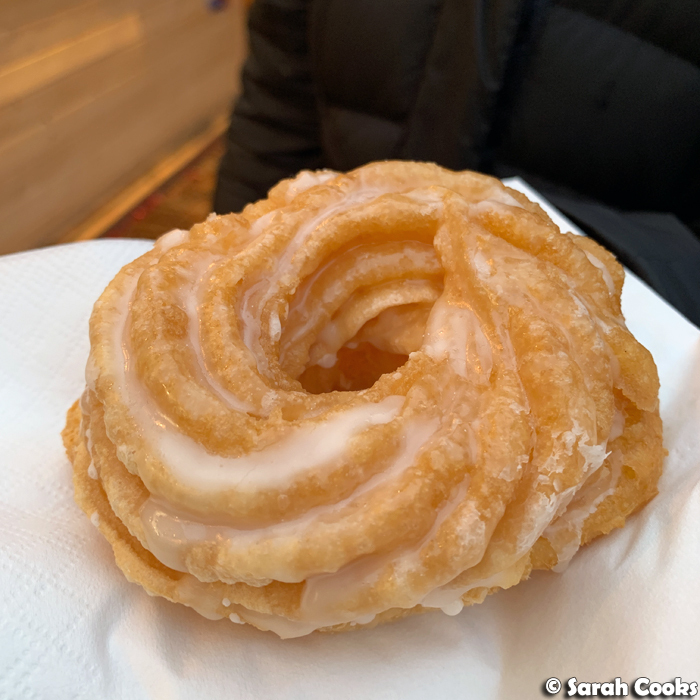 Spritzgebäck are donuts made of choux pastry, and they're incredibly light and airy. I've focused on the food offerings, but of course there are more stalls - selling things like crafts, Christmas decorations, candles and more! I thought this particular shop was very pretty. It's been so fun visiting the Christmas Markets while we've been here, and I'm so glad we got to visit a few! If you celebrate Christmas, how have you been celebrating? 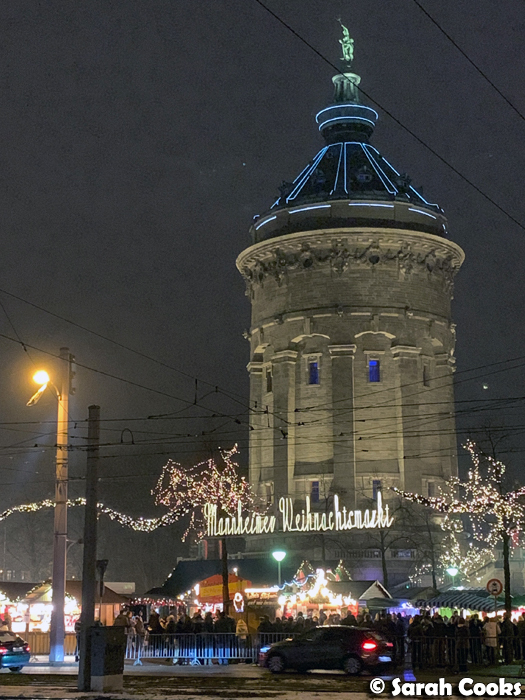 Have you been to a German Christmas Market before? What are your favourite things to eat and drink? Anything else I must try for next time? OMG. It looks great. In 2019 Welcome in christmas market in Poland. In Wrocław is Good. Wow! 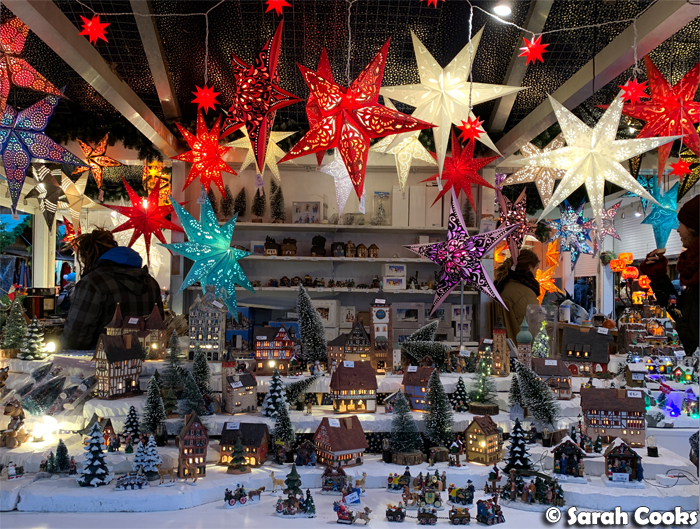 I've never been to Poland, I'd love to visit the Wrocław Christmas market one day!